In working on my most recent figurative painting, I had some difficulty achieving the variety of color temperature that I was after. Many days in the last couple of months had been dark and dreary. As it is, my studio has small north light windows which focus the light quite well but also cut out some light. So on these dark rainy days the light was quite dim and therefore limited the range of the color temperature as well as the values. In most cases, I use one dominant lightener that describes the color of the light source. Most of the year, I use a violet/red plus white. This color comes close in value to white but contains within it the dominant color of the light source. In the case of my painting, “Vertigo”, I found that I needed a variety of lighteners. The background surrounding the figure is primarily a violet/red moving toward a neutralized blue achieved by combining viridian and blue/violet. This neutralized blue anchored the darks and added variety of temperature in the background allowing the eye to move in and around the figure. But the difficulty with a strong background is that it effects the color of the flesh in ways that one might not expect. At first, I presumed it would make the flesh appear more yellow/green being the compliment of the violet/red. But I found that the flesh tended toward the violet/red as well. The violet/.red dominating the background and the figure. This was too much and the figure was overly violet/red. So my initial idea had to be revised compared to the facts that lied before me. One must adapt one’s idea or conceptions to the reality of the situation. But one must not be dominated by the situation because if one is, then every time one is with the model, one is apt to change the painting on each occasion as the situation will in fact vary over time. So one must reinvent one’s idea and do what is necessary to achieve the factual truth as well. I found that by adding two more lighteners, I achieved the temperature variety I was looking for. The lighteners were: Violet/red + white (manganase violet red, which was already a part of the palette); Blue + white ( the neutralized blue that was already a part of the palette); Green (viridian) + white (this was also already a part of the palette as such and was also contained in the neutralized blue and the OY bi color). So in the process of working on the painting, I found that if the flesh was getting too warm, too orange, I would add the blue lightener- slightly neutralizing the orange and holding it down. This became the base on which I added the green lightener as highlight on top. This green activated the flesh and created a vibrating quality that I hadn’t achieved up until that point. But I needed the cool blue on which to play off of. The green over the neutralized orange added that yellow green effect that I was looking for but could not get by just adding YG (that appeared too warm just laid-in). I still kept some of the violet/red lightener for added changes in the half tones but the lights, I entirely re-worked in the new scheme. 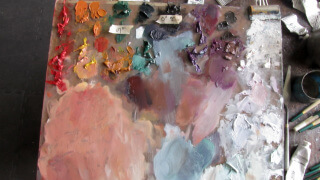 I would recommend an experiment with various lighteners when one is finding it difficult to achieve the variety in the flesh tones one is looking for. It is good to think outside the box we sometimes lock ourselves in. Judith, such an expressive and moving painting I find it very powerful and beautiful. Thank you for sharing the fascinating process by which you got your colors to work the way you wanted them to. You are very generous with your knoledge that I know is the result of years of hard work and study. Thank you.